A big slice is ready for eating (on Jessie's own wedding china). Given Jessie’s short-handed scribble on the recipe, I had to do some research and extrapolation again. (Whose phone number was that on the original recipe? I could not resolve that fascinating mystery from reverse directory, but this was from several decades ago, at least). 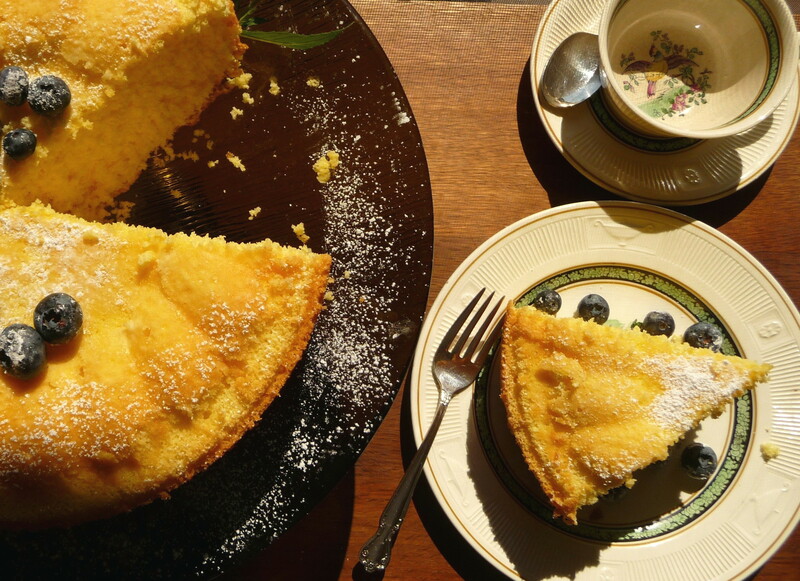 It was fun to investigate, as I had never baked a sponge cake before. Why would I have? Given my association with the dry bland commercial squares I grew up eating? I turned to Cindy Mushet’s The Art and Soul of Baking for guidance. This is superb reference book for bakers, as she carefully delineates the history, science, and technique behind classic pastries – not to mention a number of well-tested contemporary recipes in this tome-like work. I learned, for example, that Jessie’s sponge is an “egg-separated sponge”, as opposed to those with eggs prepared intact. 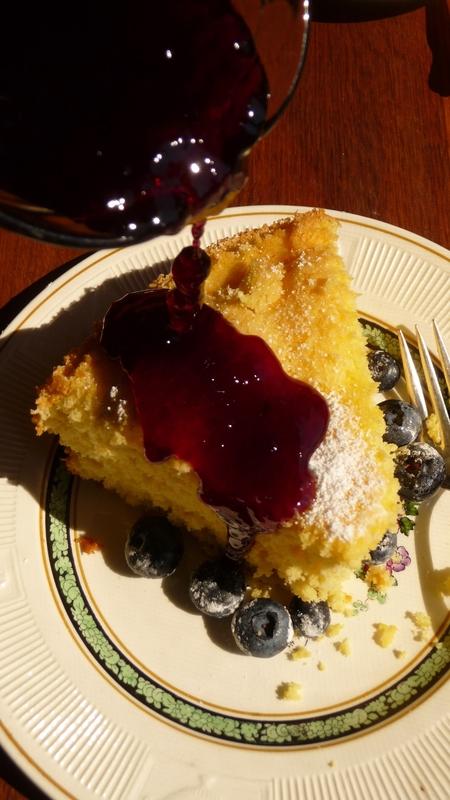 Home-made blueberry syrup and blueberries go well with sponge cake. In other recipes, I noticed the ratio of six eggs to one cup each, of flour and sugar – the same ratio featured here. However, I did not come across any others with a half-cup of orange juice. The OJ is probably why I cannot recall the recipe better, as my mother had a life-long aversion to all things citrus, while Jessie loved all such fruits. 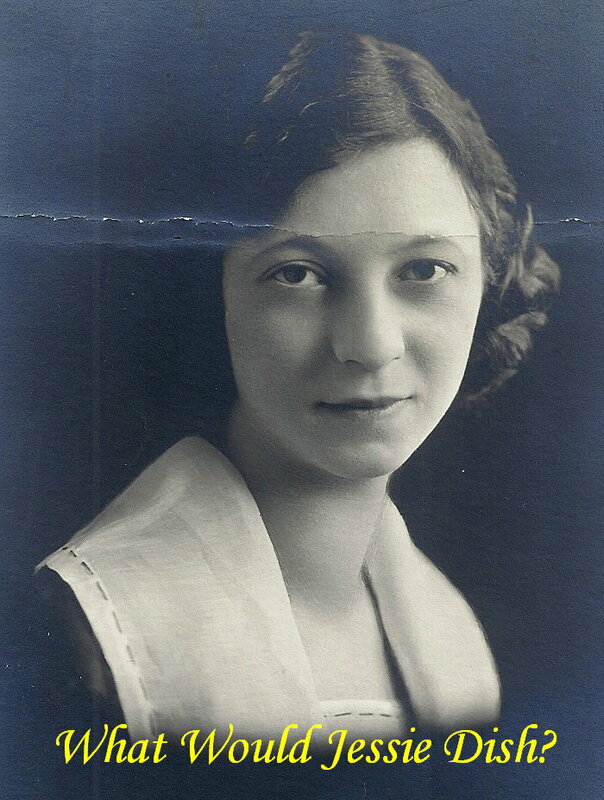 “You can’t taste that!” was Jessie’s invariable response to my mother’s detection of anything vaguely citrus-y in a dish, primarily in restaurants – this line was also a running joke in my immediate family. So Jessie might not have made this for our family because of the citrus. With a stand mixer, this cake is probably faster to assemble than many butter-based cakes with more ingredients, but it does require paying attention to the stages of the egg whites and yolks. The folding takes a bit of time, though it is not difficult, once one has the gentle, patient technique under control. I also changed the baking temperature to a consistent 325 degrees (F) for 50 minutes, rather than my grandmother’s hard-to-understand lower temperatures/varying baking times in her notes. The deep golden-brown colour indicates the cake is done. 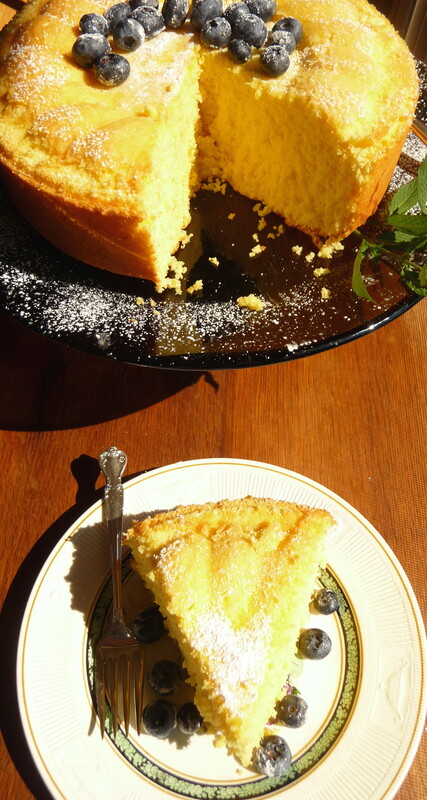 The resulting cake is airy and tall, with a delicate crumb, a subtle flavour of orange, and an interior that is not at all dry (I am trying to avoid “moist”, after Theresa’s list of culinary pet peeves on Island Vittles – long ago, I had learned about the issue with this word years ago from the wannabe lawyer who bathed in apricot Jell-o, who explained the gender-aversion to this word…). A slightly chewy or spongy texture is key to this cake, and this version did not disappoint. Depending on your mood or character, this sponge cake will serve you well with its flexibility and fine lineage of cakes from the past. Advance prep: Place rack in the oven in lower-middle position and pre-heat to 325 degrees F. Butter the top of a 9- to 10-inch (12-cup) removable bottom pan – not non-stick, and dust the inside with flour and tap out the excess. (DO NOT BUTTER OR FLOUR THE SIDES – the cake needs to cling on for dear life to rise sufficiently). Place egg yolks in the bowl of a stand mixer with the whisk attachment (or medium-large bowl for a handmixer) and mix on high speed, adding 1 cup of the sugar very slowly, for approximately five to seven minutes, until much more pale in colour and the volume has increased noticeably. Transfer mixture to another bowl (unless, of course, you are lucky enough/smart enough to have two bowls for your stand mixer) and clean mixing bowl and whisk very thoroughly, drying off before starting the egg whites. Place egg whites in bowl of stand mixer (or medium-large bowl for a handmixer), add cream of tartar, and mix on medium speed for approximately three minutes, until soft peaks form. Add one-half cup of sugar to egg whites very slowly, beating on medium for another two minutes or so until firm peaks form. Fold orange juice into egg yolk mixture gently. Fold yolk-OJ mixture into egg whites in about five or six additions, alternating with the flour but being careful to fold gently and slowly. Gently spoon the light batter into the prepared pan. Bake for 50 minutes, turning mid-way through. The cake is done when it is a rich golden brown – not pale golden and not dark brown – and the top springs back lightly to the touch. Invert cake pan over cooling rack, either on the neck of a bottle (if a ring-shaped mould) or using blocks of wood (or the equivalent) to ensure that the top of the cake does not rest on the cooling rack directly. Cool the cake completely on the rack for several hours. Turn cake pan upside down and place large plate over the cake’s top. 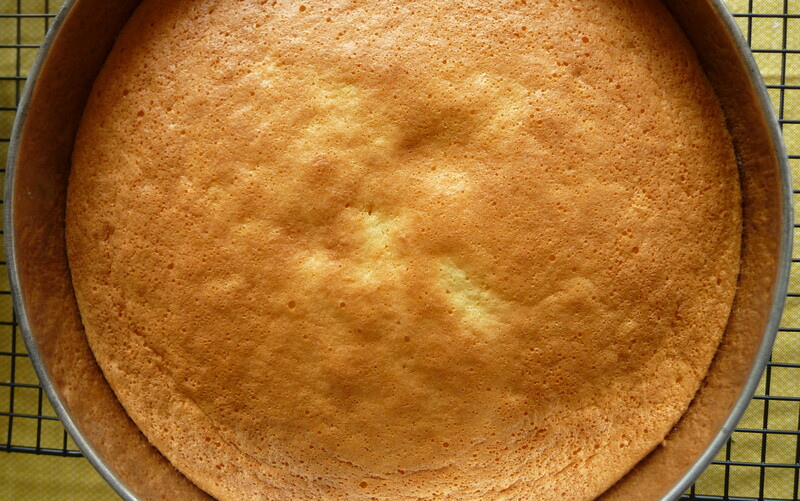 Invert the cake onto the plate, and remove false-bottom. 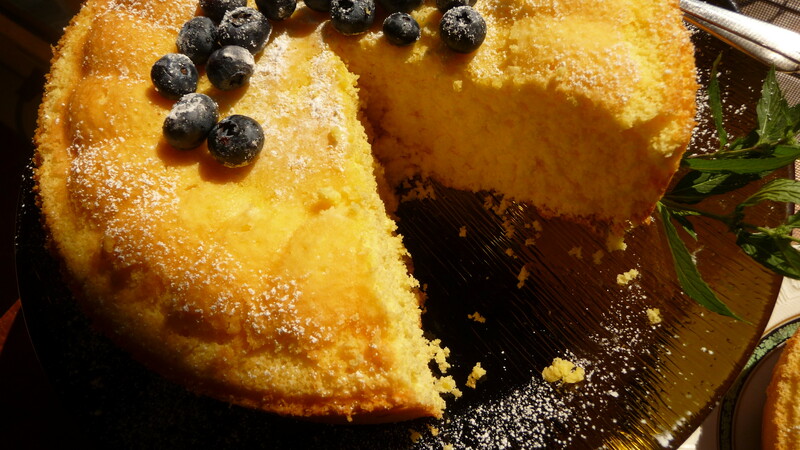 Sprinkle with confectioners sugar and serve with whatever you would like the sponge to absorb. 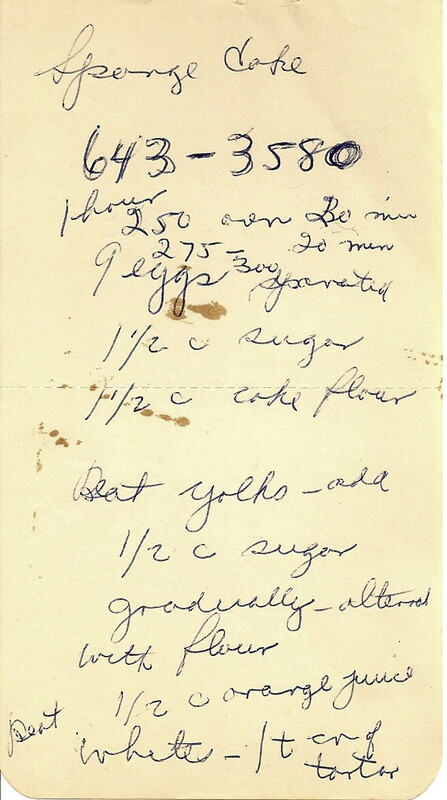 This entry was posted in Baking, Cakes, Dessert, Recipes Misc, What Would Jessie Dish and tagged Baking, Cake, Dessert, Old-Fashioned Cuisine, Sponge cake, tender, Vintage Recipes. Bookmark the permalink. That is a lovely sponge cake. 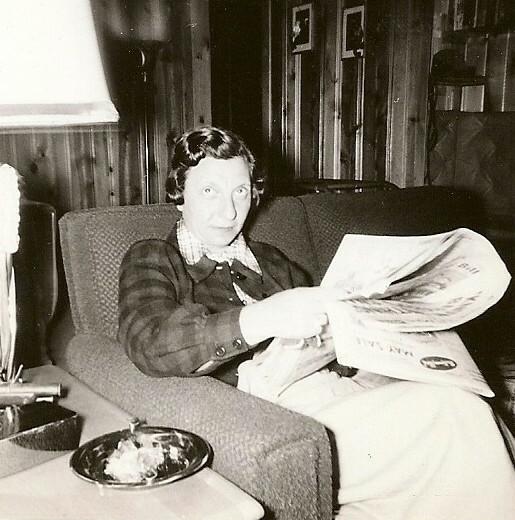 I’m enjoying reading about your recreations of your grandmother’s recipes. What a wonderful project! I like the word ‘moist’. I’m also jealous that David gets to try this cake, albeit with a slightly different topping…in fact he’s probably there right now eating said cake. I’M JEALOUS. Beautiful recipe as always from Jessie – the more you post the more European influences she seems to have! I like it. 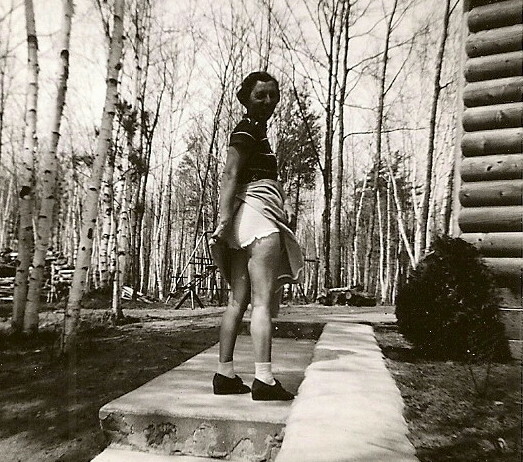 I love that, er, cheeky photo of your apparently saucy grandmother. So awesome! So interesting that the cake needs the sides of the pan to remain ungreased. I just learned something new! And how, may I ask, did you make that syrup—do you just boil berries with a bit of sugar until they break down a bit? It looks über-yummy. Thanks, Maddie. I thought that photo was pretty funny, too. The blueberry syrup was one half of “blueberry bonanza” in the” Bernardin Complete Guide to Home Canning” (I think it’s “Ball” in the US of A), which makes a blueberry butter and said syrup, from the same (big) batch o’ blueberries – that is the “bonanza” part, with a total yield of 12 half-pints. Let me know if you want me to scan the recipe for you. That is one gorgeous cake, Dan. I’m also a huge fan of the Victoria sponge. It’s closer to a classic poundcake as the eggs aren’t separated before they’re added to the batter. Split and filled with strawberry or raspberry jam and fresh whipped cream it’s absolutely divine. Merci, Pierre. En effet, le gâteau était tres moelleux. J’espère que tout va bien à Paris!